As someone who would never think I’d be able to travel outside of the United States a day in my life, I’ve been very fortunate to travel the world for my job. As a personal development coach, I’ve been invited to speak in several countries. Indonesia, Spain, Greece are just a few. 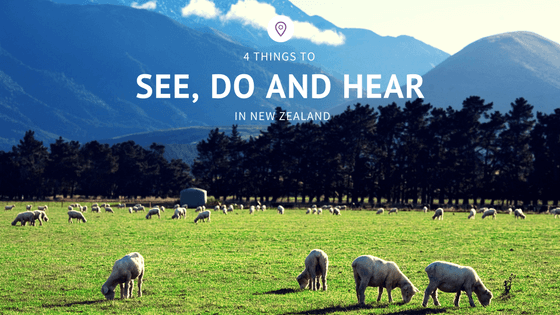 As one of the first blogs in a series of travel blogs, I’m here to tell you about things you should see, hear and do in New Zealand. Not far from the Bay of Plenty sits the city of Rotorua, which is filled with plenty of geothermal and volcanic activity. Feast your eyes and ears on nature’s wonders of steaming and hissing geysers, bubbling mud pools and volcanic craters. And for the couple who needs to unwind, you can relax in Rotora’s mineral waters, which have historically been used for healing ailments as early as the 1800s. With plenty of spas in the area and gorgeous lake views, Rotura can be an adventurous, yet relaxing haven. Sitting in the pristine region New Zealand’s west coast sits Fox Glacier. As the longest glacier in New Zealand, it measures 12 kilometres in length, and extends from the highest mountain peaks in the country all the way to the rainforest floors some 2,600 meters below. You can take a helicopter to the top, then walk, heli-hike or ice-climb your way along the glacier through a guided tour. With an overwhelming 144 islands, the Bay of Islands has plenty of watersports opportunities on both land and sea. You can swim with the dolphins on a half-day cruise, go scuba diving off the coast of Paihia, kayak, and even sail through the famous Hole in the Rock, which is an 18-meter opening in a rock formation that’s visible when the tide is low. If you’re looking to take it easy, feel free to relax on the beaches and fish as well. The Bay of Islands is about a three hour drive from Auckland, so if you’re looking to spend a day of adventure in the area, it’s best to get started early! Deemed as the place where “mountains meet the sea,” this one-of-a-kind tourist destination will leave visitors in awe. Not only is the town gorgeous, but the tectonic activity in the area brings about converging ocean currents and plenty of marine activity. Similar to the Bay of Islands, you can swim with dolphins in Kaikoura as well. But what Kaikoura is most famous for are the Giant Sperm Whales. According to the town’s history, Giant Sperm Whales are what brought a their ancestors to New Zealand centuries ago, and as such, the Giant Sperm Whale serves as an important symbol to the people of the area. Visitors can enrich themselves in the area’s culture by hopping on a cruise ship for an opportunity to get up close.